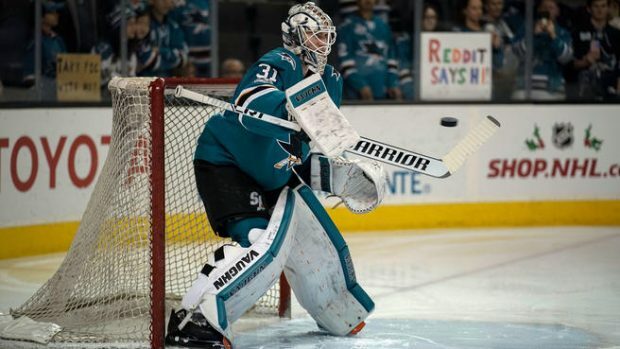 Following a statistically shaky regular season and another premature playoff exit against the Vegas Golden Knights in the second round, San Jose Sharks goalie Martin Jones has become a question mark in net for many fans and analysts around the league. After being pulled twice in San Jose’s series against Vegas and having a string of poor outings for the Sharks, it wouldn’t be completely unfair to wonder if Jones isn’t the longterm solution in goal for Peter DeBoer’s squad. However, I believe that despite all the reasons to doubt him, the Sharks have nothing to worry about in goal. At the age of just 28, which is still relatively young for an NHL goaltender, Martin Jones has already made his mark on the league, perhaps more so than most goalies of the same age right now. 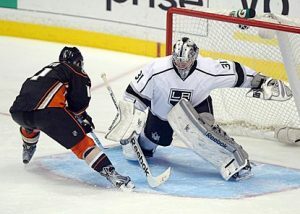 An undrafted free agent picked up by the Los Angeles Kings, Jones spent 3-plus seasons with their AHL affiliate in Manchester, before getting his shot in the big league in December 2013, a 3-2 shootout victory against the cross-city rival Anaheim Ducks. Jones went on to make history, winning his first 8 career starts, matching the NHL record set in the 1982-83 season. In that string of wins, Jones posted a remarkable 0.98 GAA and .966 SV%, along with 3 shutouts during that stretch. Jones earned his spot on the Kings roster as the backup to Jonathan Quick for the following 2013-14 season. He appeared in 19 games that year, going 12-6, with a 1.81 GAA and .934 SV%. En route to the Los Angeles King’s second Stanley Cup, he played in 2 playoff games before receiving his Cup ring. 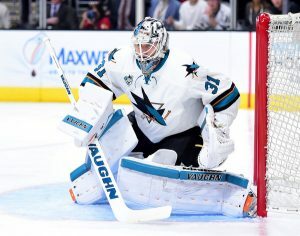 He would spend another year with the Kings before being traded to the Boston Bruins in the summer of 2015, and ultimately flipped to the San Jose Sharks, slated to replace Antti Niemi and be a legitimate starter for the first time in his career. In his first season with the Sharks, Martin Jones turned heads and set a precedent not only for the team, but for himself. The 2015-16 season saw Jones finish third in the league among goalies in wins, with 37, and tied for second with 6 shutouts. He also set a San Jose team record for longest shutout streak, at 234 minutes, 33 seconds. He finished that season with a 2.27 GAA and .918 SV%, carrying the Sharks to their first ever Stanley Cup Final appearance, and within just two wins of the Cup itself. Jones was solid in those playoffs, going 14-10, and posting a strong 2.16 GAA and .923 SV%, with 3 shutouts. Martin Jones came to the Sharks and proved he could be a number one goalie in the NHL right out of the gates. However, perhaps there is some cause for concern; the past two seasons, Jones’ numbers have gotten progressively worse, as have his GP and wins totals. After his stellar premiere season in San Jose, Jones went down in GP from 2016-17 to 2017-18, from 65 to 60, down in wins, from 35 to 30, and up in GAA, from 2.40 to 2.55. He also failed to get the Sharks past the first and second round in these years, respectively. However, Jones did improve his SV% over the past two seasons, from .912 to .915, and posted 2 more shutouts this season than in the previous year, with 4 in the regular season. Save percentage is usually more reliable and indicative of a goalie’s play than their Goals Against Average, so perhaps Jones deserves a pass on the very average GAA. One thing that has certainly not faltered is Martin Jones’s postseason play. In a first-round exit against the Edmonton Oilers in the 2017 Stanley Cup playoffs, Jones was hardly to blame for San Jose’s shortcomings, as he put up a 1.75 GAA and .935 SV% plus a shutout, despite going 2-4 in net and losing the series. Going into these 2018 playoffs, Jones and the Sharks were not favored to beat their first-round opponent, the Anaheim Ducks. They responded by sweeping Anaheim, while Jones allowed only 4 goals the entire series. It looked as though they were a much stronger group than many had assumed this year. Set to face the expansion Vegas Golden Knights in the second round after their own sweep of the LA Kings, Jones had all kinds of onus on him to continue his exceptional play. In Game 1 of the series, however, Jones was chased from his net in a whopping 7-0 loss. Jones would be pulled once again in Game 5, and would ultimately lose Game 6 to hand Vegas a ticket to the Western Conference Final. Despite seemingly bad play in that series, Jones still finished the 2018 postseason 6-4, with a 2.26 GAA and .928 SV%, plus 2 shutouts. Statistics alone could probably prove why Jones was not entirely at fault for the Sharks loss, but there’s a couple of other factors that could further the argument. Martin Jones came up big when the Sharks needed him to. After a Game 1 loss, he rebounded with a big win for San Jose. After a Game 3 loss, he showed up again, posting a shutout to even the series at 2 games apiece. Even in a Game 6 loss to effectively end the series, Jones had only 2 goals allowed, saving 30 of 32 shots for a .938 SV%. 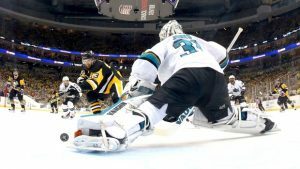 The Sharks’ biggest roadblock to advancing to the Western Conference Final was not their own goaltending, but the goaltending of Marc-Andre Fleury at the other end of the ice. Fleury stonewalled San Jose’s deep offense and kept his team in it every game. So, even when Jones was on, Fleury was on more, plus his team scored enough to win. As Sharks forward Logan Couture put it, the Sharks simply weren’t playing good enough to win the series. No excuses. Therefore, despite the heat he is taking for a handful of bad outings from Sharks fans and league analysts alike, Jones shouldn’t be the source of worry for General Manager Doug Wilson and the Sharks fanbase. With several years still left on his contract, Jones should and most likely will remain the go-to guy for DeBoer and the Sharks, and people should look for a big rebound season from him next year.